IX Brigade returned to the British front on 21 June and were rejoined there by Nos 25 and 62 Sqns. No 103 Sqn returned to their previous airfield at Serny and transferred from 9th Wing to 51st Wing (Nos 98, 103, & 107 Sqns), IX Brigade, on 25 June, before returning to the command of X Brigade on 15 July. 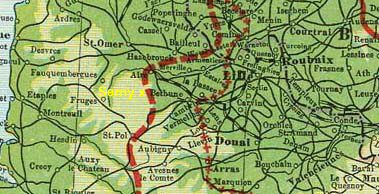 The major part of IX Brigade was sent to the French front again on 14 July, to the Champagne region, in anticipation of a further German offensive (which came that night). However before the Brigade returned to the French front, 103 Sqn participated with them in a two week experimental bombing campaign against railway targets. This started on 24 June (the day bomber squadrons involved included 49, 98, 103, 107 Sqns all with DH9s). A series of attacks was carried out on railway targets between La Bassée and Ypres. This was an experiment to see what forms of attack were most effective. The objective was to hinder enemy force concentrations in this sector of the front - railways being essential for large troop movements and supplies. Casualties were light for 103 Sqn, 2nd Lt. Souter an observer/gunner unfortunately fell to his death from his aircraft on 4 July and Lt.s Houston & Clarkes aircraft was damaged on 5 July. On 8 July Lt.s Chrispin & Wadsworth destroyed a Pfalz DII over Harbourdin-Bac St Maur and 2nd Lt. Marshall was wounded (see RAF Comm 15 below). A formation of machines of 103 Sqn while on a bomb raid was attacked by about 15 EA at a height of 15,000 feet. Lt. J G H Chrispin and 2nd Lt. E A Wadsworth fired three bursts at one of the machines which was attacking their tail; it dived down vertically and was observed to crash. On 9 July 2nd Lt.s Dunn & Hinchcliffe were missing on a reconnaissance mission and were later confirmed to be POWs. In the end, the bombing experiment was inconclusive. The Squadron shared Serny airfield with three other X Brigade squadrons: No 46 (Camels), No 88 (Bristol fighters) and No 92 (SE5s) and these would variously provide escorts for them. The Squadron continued bombing operations on railway targets for the rest of July, weather allowing. 2nd Lt. Carson & 2nd Lt. Hawkins were killed on a bombing mission on 20th, their aircraft being seen to spin down over Armentieres. Two days later while bombing Fives railway junction near Lille, Lt.s Houston & Clarke were killed in action over Houplines, Lt. Hallawell & Sgt. Watkinson suffered damage to their aircraft and 2nd Lt. Round (Lt Tyrrell's observer) was wounded. In early August 103 Sqn was part of the air concentration for the Battle of Amiens (on the Somme), held in reserve to support the main operations of V and IX Brigades. 103 Sqn had 19 aircraft available at this time. 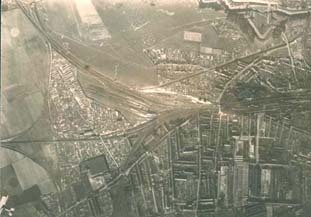 On 10 August the squadron was involved in the bombing of Peronne railway station (one of the main targets that day) along with 18 Sqn and claimed four victories against Fokker DVIIs; Lt. Dodds and 2nd Lt. Corey claiming two OOC. The following day the Squadrons missions had been switched to the north (bombing Sainghin) where they were in action over Estaires. Lt. Dodds and 2nd Lt. Corey again claiming two Fokker DVIIs OOC. Attacks continued on Peronne on 11 and 12 of August. DH9 H4229 of 103 Sqn preparing to start off, Ronchin (Lille). 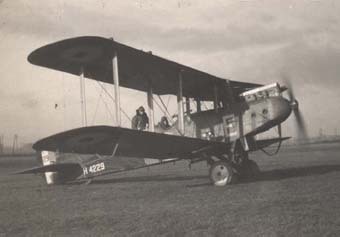 This aircraft was flown by Major Nethersole on the 9 and 10 November raids on Enghien station and nearby airfields (with Lt.s Corey and Slater). The final raids of the war. The Official History of the War in the Air makes particular reference to the performance of the DH4 and DH9 bombers during the Battle of Amiens, illustrating the poor performance of the newer aircraft.
" The DH4 fitted with the 275 horse power Rolls Royce (Eagle VI) engine was splendidly reliable. In the four days of intensive fighting from 8-11 August inclusive the DH4's of 205 Squadron were in the air for a total of 324 hours 13 minutes, and dropped sixteen tons of bombs. Every aeroplane returned from its mission and no more than one had to be struck off the strength of the squadron." " By way of comparison, a typical DH9 squadron flew a total of 115 hours in the same period and dropped four and a half tons of bombs. During the operations seven of the DH9's were lost and two others were wrecked, and ten pilots had to leave formation without dropping their bombs, through engine trouble." "A further sidelight on the engine [Puma] question is .. that in the same four days pilots of 205 Squadron required no more than a total of 3 1/2 hours in all on test flights while those of the DH9 squadron spent 21 hours in the air on similar duties."